Restoration Ecology is a fairly new field of (applied) science. To contribute to the field, we test and review our on-ground approaches and share the knowledge in the public domain. Current research includes the evaluation of direct seeded ecological restoration projects results using UAV high resolution multi-spectral imagery. Adaptive management requires evaluation of previous work in the context of stated goals. Ecological restoration is a multi-faceted field in which attention to detail and a strong work ethic are the best indicators for success. This article explores how best-practice restoration can be achieved through an ongoing review of ecological principals, and an ongoing development of innovative approaches to apply them. Examples show that layering different restoration techniques and treatments allow for incremental gains in the ecological functionality of the restored landscape. In the south-western region of Australia, allometric relationships between tree dimensional measurements and total tree biomass were developed for estimating carbon sequestered in native eucalypt woodlands. A total of 71 trees representing eight local native species from three genera were destructively sampled. Multi-species allometric equations were also developed, including ‘Mallee growth form’ and ‘all-eucalypt’ regressions. These equations were then applied to field inventory data collected from three locally dominant woodland types and eucalypt dominated environmental plantings to create robust relationships between biomass and stand basal area. This study contributes the predictive equations required to accurately quantify the carbon sequestered in native woodland ecosystems in the low rainfall region of south-western Australia. Large scale ecological restoration in a highly heterogeneous and species-rich landscape requires big commitment to ﬁne scale planning. In the southwest of Western Australia, in the Fitz-Stirling area of Gondwana Link, the Peniup Restoration project aimed to improve on such works. A multi-faceted approach was employed to re-establish a self-replicating biologically diverse plant system, ecologically informed in its design and consistent with the heterogeneous mosaic of plant associations found in the surrounding landscape. This paper summarises the approaches used and initial results of those works. This report is the second in a series that examines the role of natural forests and woodlands in the storage of carbon. Understanding the role of natural ecosystems in carbon storage is an important part of solving the climate change problem. For the first time, we provide an overview of the vegetation structure, climate, geology and historical land use of the Great Western Woodlands (GWW), and examine how these interact to affect the carbon dynamics of this region’s landscape ecosystems. We constructed a spatial model to estimate biomass carbon stocks of the woodlands at the present day, and to infer an upper limit to the carbon sequestration potential of the GWW. A range of management options to enable protection of high quality carbon stocks and restoration of degraded stocks are evaluated. 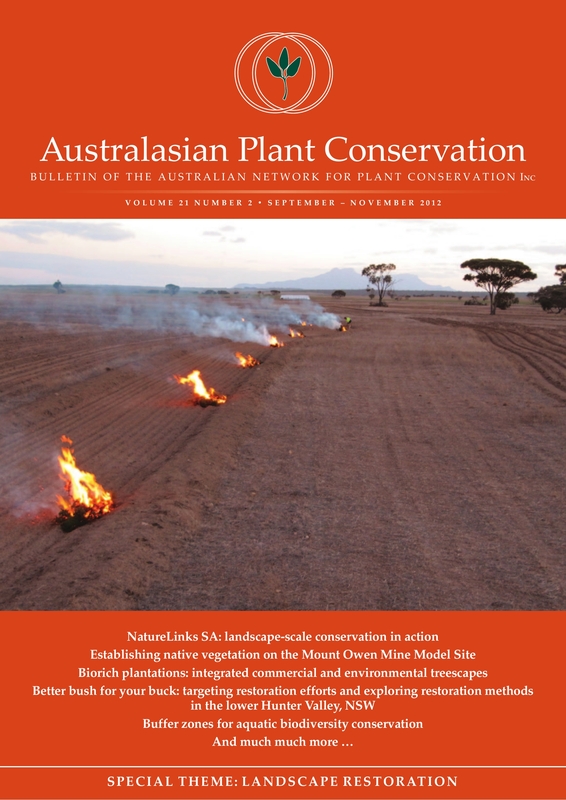 This article discusses the innovations in the ecological restoration planning and execution as they were designed for the Peniup restoration project in Western Australia. It demonstrates that analysing and understanding soils is crucial to get a satisfactory re-vegetation result. This highlights the need for alternative establishment techniques on challenging soils, but also for more strategic prioritization of establishment approaches and time lines for the restoration of a property.